We meet at the site on Thursdays 11am – 1:30 pm and welcome all artists. If you wish to share your work meet back at 1:15. We return to this location by request. Monterey Ave. is the cross street. At this neighborhood coffee bar you may stay at plaza level or go to the side garden area to paint. Also, across the street, local store fronts, the busy Monterey Market, and Berkeley Horticultural Nursery provide many views. The dead end of Monte Cresta Ave. provides open vistas of Alvarado Park, Wildcat Canyon, and further parklands to the Bay. Take I-80 north to the San Pablo Dam Rd. exit and turn right onto San Pablo Dam Road. Next turn right onto Morrow Dr., and then turn left onto Hillcrest Road. Follow Hillcrest a while. Turn right onto Bonita Rd., then left onto Monte Cresta Ave. We meet at the end. 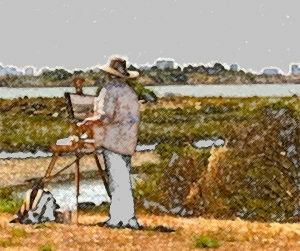 Colusa Circle is a new neighborhood venue for ECAA plein air painters. The central roundabout circles an old live oak and artfully forwards the traffic from five feeder roads on its way. There are interesting store fronts, and views of the hills and the Bay. We will meet in the outdoor garden area a store front or two south of Semifreddi’s Bakery, 372 Colusa Ave.
FROM BERKELEY take I-80 to the University Exit and go east toward campus. Turn left onto Oxford St., right onto Rose St., and left onto Spruce St. Follow Spruce St. uphill. At the intersection with Grizzly Peak Blvd., Spruce St. changes name to Wildcat Canyon Rd. At the Grizzly Peak Blvd. intersection continue straight ahead and follow Wildcat Canyon Road past the Brazilian Room, and the Regional Parks Botanic Garden, and continue following the signs to Inspiration Point. Meet in the parking lot to the left. Our Plein Air group meets Thursdays at 11 am – 1:30 pm. Locations from February to November are announced here on the ECAA website and in our members’ online newsletter, The Palette. During December and January we meet at the Blake Garden, 70 Rincon Road, Kensington blakegarden.ced.berkeley.edu as weather permits.